Asbestos is the name given to a group of silicate minerals that occur naturally in the environment as bundles of fibres. These minerals are either of the serpentine group or the amphibole group. Serpentine asbestos includes the mineral chrysotile, or ‘white asbestos’, which has long, curly fibres that can be woven. Chrysotile asbestos is the form that has been used most widely in commercial applications. Amphibole asbestos includes the minerals actinolite, tremolite, anthophyllite, crocidolite, or ‘blue asbestos’, and amosite – ‘brown asbestos’. Amphibole asbestos has straight, needle-like fibres. Asbestos minerals occur widely in the environment. They may be found in large natural deposits or as contaminants in other minerals e.g. in talc. Because of asbestos’s many advantageous qualities such as strength, flexibility, heat stability, insulation properties, adsorption capacity and resistance to degradation, it has been used worldwide in numerous ways. Asbestos use in human culture dates back at least 4,500 years. The actual commercial use of asbestos began in the late 19th Century. Asbestos has been used in roofing, insulation and flooring materials, cement, gaskets, brakes, plastics, textiles and so on. Workers in mining, construction, shipbuilding, automotive industry and manufacturing of asbestos products have been exposed to asbestos. It is estimated, that the peak consumption year of asbestos was 1975, when about 5.1 million metric tonnes of it was used. Even today, the worldwide use of asbestos adds up to 2.5 metric tonnes per year, mainly in construction materials, asbestos cement, insulation and fire protection. A total of 125 million people are still occupationally exposed to asbestos. The production and use of asbestos has moved steadily from industrialised countries to the developing world and to countries of rapid industrialisation. Asbestos has been known to have adverse health effects since the first half of the 20th Century – the first diagnosis of asbestosis was made in the UK in 1924. First asbestos-related lung cancer cases were reported in 1935 and the first study to show increased risk of lung cancer among asbestos textile workers was published in 1955. The first report of a possible association between asbestos exposure and mesothelioma (cancer of pleura or peritoneum) was a study that described an outbreak of mesothelioma in a crocidolite mining region of South Africa in 1960. Since then, numerous studies have supported these findings. In addition, there is evidence that laryngeal cancer and cancer of the ovary may also be caused by asbestos exposure. Asbestos fibres get into air when asbestos materials are handled or processed. Family members of asbestos workers may also be exposed to fibres that an asbestos worker brings home in his or her clothes. Car brakes and clutches used to be asbestos fibre sources in the urban environment. Exposure may also occur through ingestion of drinking water which is contaminated with asbestos. In all, low levels of asbestos are present in the air, water, and soil. A key factor in the risk of developing an asbestos-related disease is the total number of fibres breathed in. Working on or near damaged asbestos-containing materials or breathing in high levels of asbestos fibres, which may be many hundreds of times that of environmental levels, can increase the risk of getting an asbestos-related disease. When handled, asbestos can separate into microscopic sized particles that remain in the air and are easily inhaled. After inhalation, fibres end up in the smallest bronchial tubes and the alveoli, where the gas exchange in the lungs happens. The fibres can also be transferred via the lymphatic veins to different parts of the body. Fibres are very damaging to the body, causing scarring and inflammation in tissues. The development of an actual disease due to this inflammation takes many years, from ten up to 40 years (latency period). All types of asbestos fibres are known to cause serious health hazards in humans. After the wide use of asbestos in the 20th Century, hundreds of thousands of workers in industrialised countries have contracted an asbestos-related disease. According to World Health Organization (WHO) estimates, more than 107,000 people die each year from asbestos-related lung cancer, mesothelioma and asbestosis resulting from occupational exposures. While in recent years workers who handle asbestos-based products are obliged to wear PPE, from gloves and coveralls through to Respiratory Protective Equipment to guard against the numerous ills the substance can inflict, there is a large school of thought arguing that banning its use is the best way to mitigate against such diseases. The most frequent health effect of asbestos is bilateral pleural plaques, which may be a consequence of low asbestos exposure. Plaques are formed in the outer leaflet of the pleura and do not cause any symptoms, because they usually have no effect on respiratory function. They can therefore be merely a sign of asbestos exposure. Diffuse pleural thickening is another benign phenomenon caused by asbestos. It affects the visceral (inner) leaflet of the pleura. It may be a consequence of benign asbestos pleuritis, which is an abnormal collection of fluid between the thin layers of tissue lining the lungs and the wall of the chest cavity. Although it’s benign, diffuse pleural thickening can be associated with mild to severe pulmonary function deficit. Asbestos exposure may also cause asbestosis, an inflammatory condition affecting the lungs that can cause shortness of breath, coughing, and permanent lung damage. 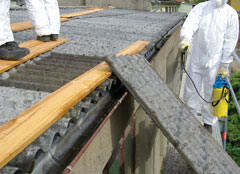 Asbestosis may develop after a major exposure to asbestos; for example, in construction work. In asbestosis the lung tissue is replaced by fibrous tissue, which gradually worsens the respiratory function. There is no cure for asbestosis, and the illness leads to worsening pulmonary disability. Mesothelioma is a cancer which affects the lining of the lungs (pleura) and the lining surrounding the lower digestive tract (peritoneum). By the time it is diagnosed, it is almost always fatal. Asbestos and anothernatural fibrous mineral, erionite, are the only known causes of mesothelioma. Mesothelioma can occur in cases of low asbestos exposure, although very low background environmental exposure carries only an extremely low risk. In different studies about 80% of mesotheliomas have been able to be linked to occupational asbestos exposure. The latency period of mesothelioma is 30-40 years on average. Smoking has no influence on the risk of mesothelioma. The association between asbestos exposure and lung cancer has been well established in many epidemiological studies. The cell type, location or clinical signs and symptoms of asbestos-related cancer do not differ from those of lung cancer of other causes. A minimum lag-time of ten years from the first asbestos exposure is required to attribute the lung cancer to asbestos. Heavy asbestos exposure increases the risk of lung cancer twofold, when lung cancer is considered to be attributable to asbestos. Even less than one year of heavy asbestos exposure, e.g. from asbestos spraying, may increase the lung cancer risk twofold. The presence of asbestosis is an indicator of high exposure. Because chrysotile fibres are less biopersistent than amphibole fibres, it has been suggested that its potential to cause lung cancer would be smaller than the amphiboles’. The International Agency for Research on Cancer (IARC) working group has noted that lower biopersistency of chrysotile in the lungs does not necessarily imply that it would be less potent to cause lung cancer. Based on the research data so far, it has been concluded that all types of asbestos fibres are associated with lung cancer. Many studies have shown that the combination of smoking and asbestos exposure is particularly hazardous. Smokers who are also exposed to asbestos have a risk of developing lung cancer that is greater than the individual risks from asbestos and smoking added together. There is evidence that quitting smoking will reduce the risk of lung cancer among asbestos-exposed workers. As anyone, people who were exposed to asbestos on the job at any time during their life or who suspect they may have been exposed, should not smoke. IARC has concluded that there is sufficient evidence for asbestos-causation of laryngeal cancer. It should be viewed as an asbestos-caused disease when work history shows strong asbestos exposure. Asbestos was widely used in construction materials in Finland, mainly during the 1960s and 1970s. There were two anthophyllite mines operating in Eastern Finland from 1907-1975. Finland also imported asbestos – chrysotile, amosite and crocidolite. All kinds of uses of asbestos were banned by the year 1994, but it is estimated that half of the asbestos that was used in construction is still in place. According to Finnish registers about 1,000 workers – mainly in maintenance or construction – are still occupationally exposed to asbestos. Asbestos removal work has been subject to license since 1988, and can only be performed by people who have undergone special training. If removal work is carried out correctly, the risk of exposure is minor. Due to earlier asbestos exposure, new ARDs (asbestos related diseases) are still diagnosed in Finland. The numbers of lung cancer and mesothelioma show an almost flat trend with about 50 new lung cancers and 50 new mesotheliomas each year. It is estimated that the incidence of mesothelioma and lung cancer will begin to diminish later this decade. About a 50% reduction in the number of registered asbestosis cases from the highest values of the mid 1990s has already been seen. There have, nevertheless, been individual cases of asbestos pleural plaques in workers who have been working in asbestos removal work since 1988. Based on these cases, questions have arisen about the safety of current demolition techniques, the reliability of protective devices, the quality of the professional skills, safety behaviour among abatement workers, whether the economic pressures of asbestos abatement firms affect work safety, and whether work safety authorities have sufficient resources for controlling asbestos work. As long as we have asbestos in our constructed environment, we constantly have to take keep the topic under discussion. The prevention of ARDs is based on identification of exposure sources and exposed people. An individual worker should be offered health education and an introduction to safe work practises, the help and means to stop smoking, and health surveillance. The work environment is the most important target for preventive measures, which include avoiding the use of asbestos, carefully controlling the dust emissions e.g. using wet techniques to protect workers as well as people in the near environment, and controlling passive smoking in the workplace. Exposure to asbestos in occupational settings is regulated in countries of the EU. According to the European Directive of the EC 2003/18, the permissible limit is 0.1 fibres per milliliter for all types of asbestos, based on an eight hour time-weighted average. The same limit is in force in many other countries, whereas some have permissible limits up to 2 fibres/cm3. The relevant authorities, employers, workers, building owners and public should be trained and informed about asbestos and its hazards and the prevention of ARDs. Healthcare and occupational safety personnel should be trained on prevention, recognition and diagnosis of ARDs. As yet there is no common consensus on the possibilities for screening ARDs. Research is being done to find out if mesothelioma could be detected early enough for curative treatment. Biomarkers may be useful in this context in the future. Lung cancer screening has not been studied enough among asbestos exposed persons. The low dose computed tomography is a promising method, but its benefits in reducing mortality from lung cancer are still not established. Fifty-five countries have banned the use of new asbestos and undertaken regulatory and practical measures for the protection of workers. The use of asbestos products was banned in all countries of the European Union in 2005. The adverse health effects from exposures in the past will nevertheless be seen for many decades to come. In 2012, there were 35 countries that used more than 500 metric tonnes asbestos. In countries that still use asbestos, asbestos-induced illnesses are increasing. The global prevalence of mesothelioma is growing at a rate of 5% per year. The global epidemic of ARDs is expected to continue well into the second half of the 21st Century. The WHO and the International Labour Organization (ILO) support a global ban on asbestos, but so far the economic interests of states and organisations have overrun the health perspective. Asbestos is produced and used the most in Asia, Russia and other former Soviet countries; that is, in countries where there is not enough knowledge about its dangers and where people do not necessarily know how to protect themselves correctly. Long latency periods between exposure and illness may prevent people from seeing the connection between asbestos and disease. As previous markets for asbestos are closing down – in Europe, for example – asbestos exporters are redirecting their marketing towards developing countries. It should be noted, however, that if all the long term health and social costs are considered, the overall financial impact of asbestos is clearly negative. The International Conference on Monitoring and Surveillance of Asbestos Related Diseases in February 2014 in Espoo, Finland, gathered together 140 experts from 23 countries. The main message from the conference was that there is no safe use of asbestos and the only way of preventing asbestos-related deaths is by banning the new use of asbestos throughout the world. The Helsinki Criteria is an internationally used document of expert recommendations for the assessment of asbestos exposure and the diagnostics of ARDs. The document has been updated and its recommendations were discussed at the conference. It will be published later this year.